C120R Forestry Mulcher | Forestry Machines | Ohio | Rayco Mfg. 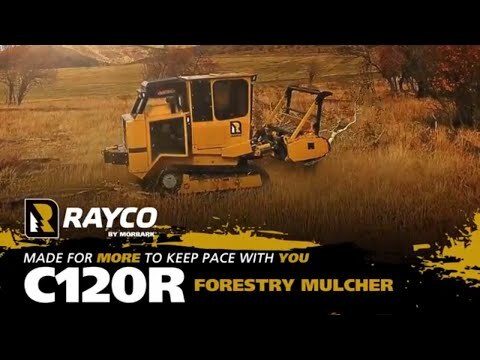 Rayco’s C120R Forestry Mulcher is the answer if you’re looking for a purpose-built mulcher but need the versatility of rubber tracks. Our customers demanded a mulcher that was capable of crossing roadways and sensitive turf but still had the power and in-woods characteristics of a dedicated forestry machine. The C120R answers that call. It rides on a 17.7-inch wide rubber track. A reliable, 120-hp Cat diesel engine supplies power, while Rayco’s exclusive Super Flow, closed loop hydrostatic system delivers mulching power not found in ordinary compact track loaders. Purpose built for mulching, the C120R features a hydraulic winch, and Rayco’s exclusive elevated cooling design, which places hydraulic radiators in the limbriser for maximum cooling performance in the harshest climates.